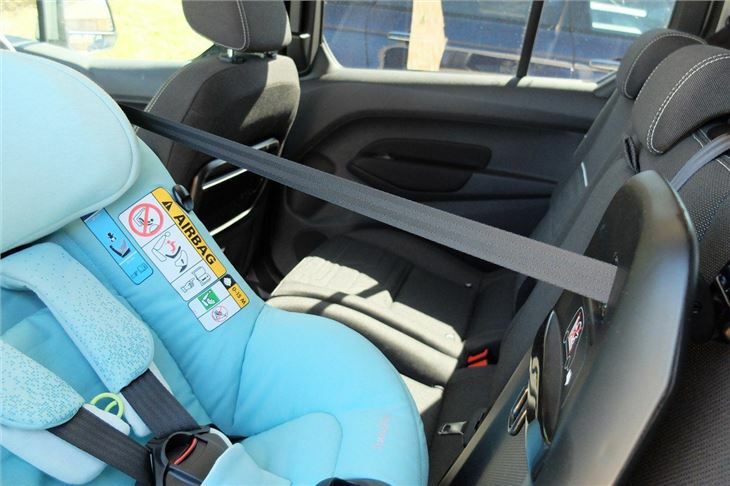 The Maxi-Cosi AxissFix is one of the handful of swivelling car seats on the market. 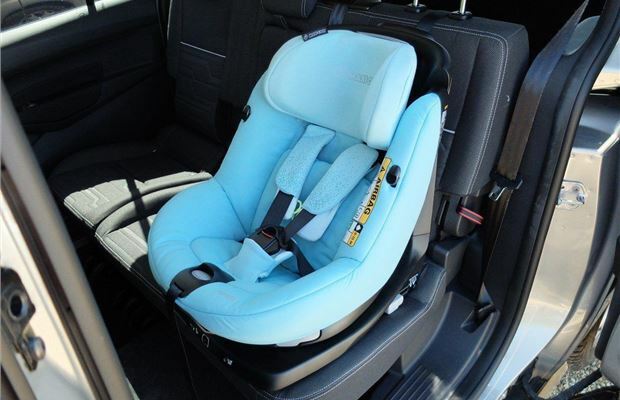 These tend to be the most feature-laden car seats around and therefore the most expensive. Indeed at close to £400 new, the AxissFix is a big investment and competes with the Recaro Zero.1 and the cheaper Britax DualFix. Having a 360 degree swivelling seat has obvious advantages of course. And for many parents, it's worth the money if it makes it that much easier to not only get your little one into their car seat without putting your back out, but also make sure they are strapped in correctly and safely. 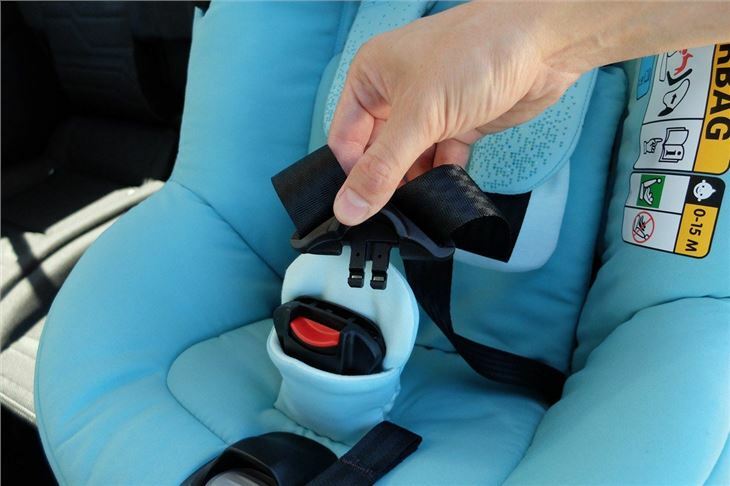 It's a Group 0+/1 car seat but unlike some of the competition it's not suitable from birth - instead the AxissFix is for 4 months to around 4 years. So that means you'd have to buy another car seat for newborns. It seems Maxi-Cosi has overcome this problem though because from late 2016 this seat has been superceded by the newer AxissFix Plus, which is suitable from birth thanks to a new padded insert. The AxissFix Plus costs £395 new but the good news is that the AxissFix is still available online and we've seen it down to £275 through some online retailers. It's also i-size compliant - the new standard for child seat safety which will run parallel to the current regulation until 2018. 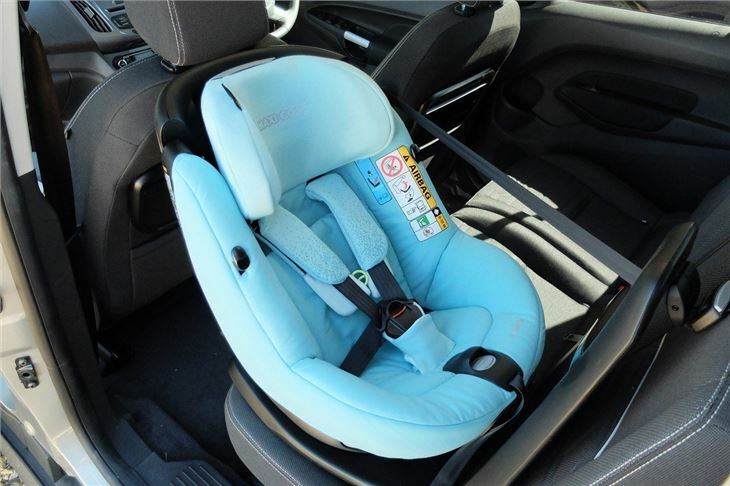 It also comes with a top tether system, which no other swivelling car seat we've tested has. The AxissFix is a pretty bulky car seat and at close to 12.5kg it's not light either. Getting it out of the box in the first place is hard enough. That's down to the large base unit which has a high back as as part of the top tether system. 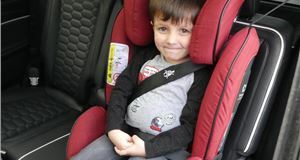 Top tether is unusual in swivelling car seats - in fact the AxissFix is the only one we've tested that has this. Most other 360 seats use a rebound bar and have an adjustable leg to prevent the seat from tipping forward in the event of an accident. The top tether system adds another level of complexity when fitting the seat - you have to thread the belt under the rear headrest and then go in through the boot to hook it onto the tether point. So it's not the sort of seat you want to be moving between cars on a regular basis. It is very secure when fitted though and with the strap adjusted tight, the seat feels firmly in place with very little movement. It's crucial to check that your car has a top tether point first though, especially if you have a saloon or coupe. 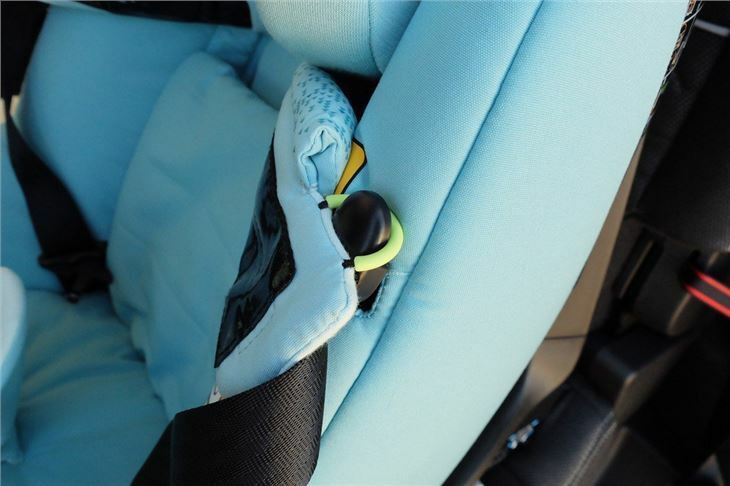 With a smooth swivelling action, the AxissFix feels like a well made car seat. The handle to spin it around isn't the easiest to use as you have to twist your hand to an odd angle. We did find ourselves fumbling a bit in the dark to locate it. The central handle in something like the Nuna REBL is easier to use. But that's only a minor criticism. 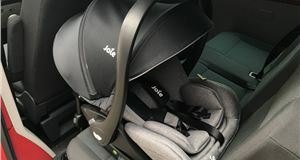 The rest of the seat is impressive and we like features like the grippy backs to the seatbelt covers, to stop them sliding off your little ones shoulders. The bright yellow hooks (above) keep the seatbelts out of the way when you're putting your child in the seat while the padding is nice and thick. The material used is also good quality and feels like it could handle several years of hard work. The main issue with the AxissFix is the lack of recline. Due to the design and the high back, it doesn't recline very much, so depending on how your child sleeps - and how old they are - you could find their head flopping forward. However, this does also depend on the car you have and the design of the seats. The flatter the seat base, the better. 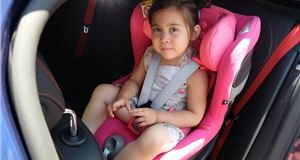 When rear facing there is also a strap (see below) from the seat to the base back which our chief tester, 18 month-old Eden, thought was a great thing to play with and try and hold onto when we were driving along. The seat belt pins are now plastic rather than metal. They are of course as safe, but we still like the feel of a metal buckle. But on the plus side, there's a proper cover for the buckle so that you won't pinch your little ones legs in the summer. We tested the AxissFix in a variety of cars from estates like the Audi A4 Avant to hatchbacks like the Citroen C4. In our pictures we're using a people carrier - the Ford Tourneo Courier. 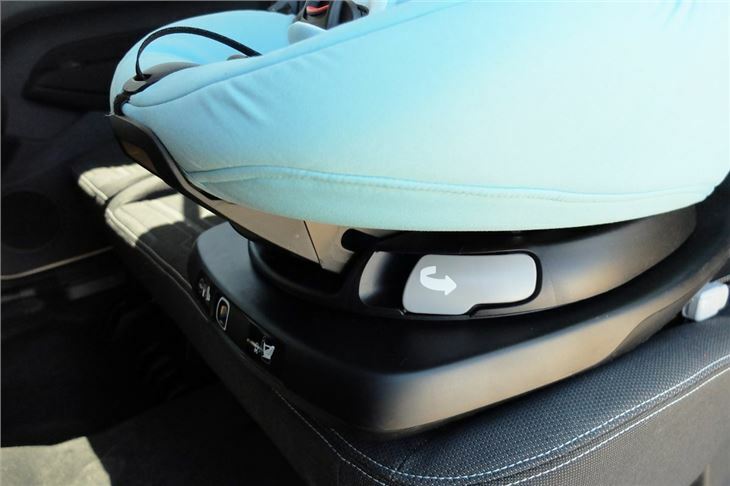 While the top tether can be fiddly, the Isofix arms click into place easily and have simple adjusters for extending them if needed, although the buttons do feel a little flimsy. 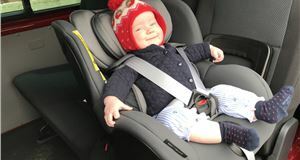 If you're after a 360 swivelling car seat then the Maxi-Cosi AxissFix is one of only a handful on the market. Like the others, it's not cheap. Go for the updated version of the seat we tested and it will set you back £395. That's a big investment when you can get a Joie Spin 360 for £250. However, this older version is cheaper if you search online. While it's pricey, the AxissFix does feel like a high quality product that's well made. The fact it has a top tether system, which no other swivelling seat has, is good for the added security but a faff if you're going to be regularly moving the seat between cars. It took us far longer to take out than seats like the Nuna REBL and Britax DualFix which just require to the two Isofix arms to be unclipped. The lack of recline isn't unique to this seat, it's an issue that we've found with several seats designed to be used from birth to 4 years old. However, it does seem to be more pronounced in the AxissFix, but this does depend on the car you have and how old your child is. As always, it's worth trying out the AxissFix in your car if you can. Most big car seat retailers will be more than happy for you to test the fit and it's crucial you're happy with it. If the slight lack of recline isn't a problem and you want the added safety of the top tether than the AxissFix is ideal. But if you want a seat that's easy to move between cars we'd suggest going for something like the cheaper Joie Spin 360.